Family friendly canvas tent with large wooden terrace. These tents include an indoor living/dining area, with a fully kitted out kitchenette and a BBQ outdoors. Newly refurbished shower block facilities are a short stroll away. Sleeping quarters are: one double bedroom, and a second bedroom with two single beds. Please bring your own bedding or hire these as an additional extra. Just 20 metres from the beach, if you love tranquillity and unspoilt nature, you will be seduced by Huttopia Côte Sauvage campsite. Peaceful holidays guaranteed on the Ile-de-Ré! Campers will be seduced by the peaceful atmosphere and wild environment. As a couple or as a family, you are sure to find a corner of nature just for you. 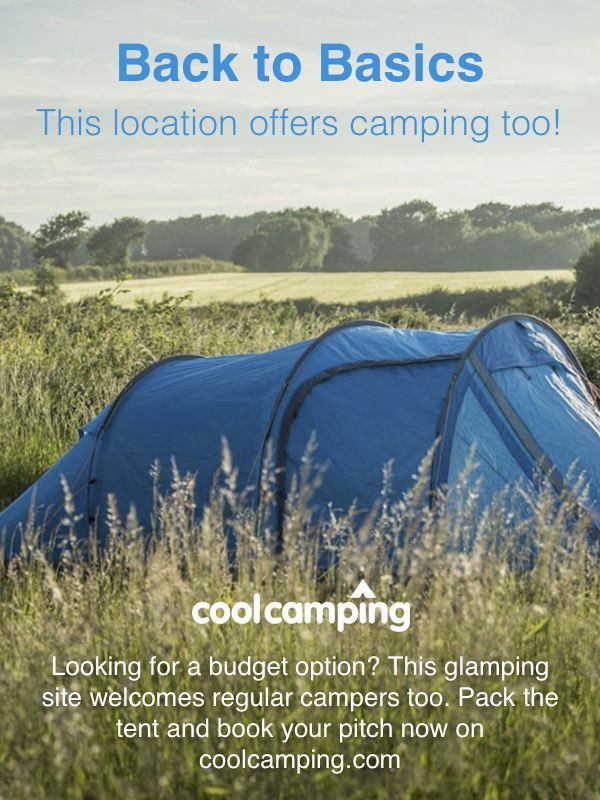 Fridges for campers to hireTravel light! Camping is easy with our baby kit (cot + high chair)Motorhome service area on site. You will love enjoying ice creams as a family on the terrace of the snack wagon when you get back from your surf lesson on Grenettes beach. Huttopia Côte Sauvage campsite offers a wide range of other services to make your stay even more enjoyable. Enjoy simple, friendly cuisine during your stay in Côte Sauvage. A Pizza-Grill (open from 05/07 to 02/09) where you can have a drink on the terrace or enjoy one of our salads, home-made pizzas or grills.your bread and pastries the day before. Because we are committed to working with local producers, the village bakery delivers to us every morning. Just 20 metres from the ocean, you can reach Basse Benaie beach by foot from Huttopia Côte Sauvage campsite. You can also reasily reach other beaches by bike, each with their own atmosphere. In Sainte-Marie-de-Ré, Notre-Dame beach is recommended for shellfish gathering, the beaches of Montamer and La Salée are great for swimming at high tide, and Grenettes beach is ideal for surfing. 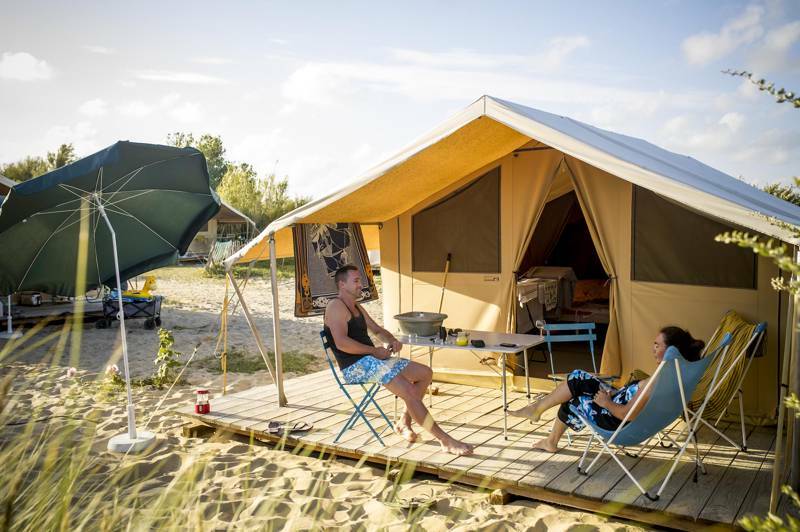 Just 20 metres from the beach, if you love tranquillity and unspoilt nature, you will be seduced by Huttopia Côte Sauvage - Ile de Ré Campsite. Peaceful holidays guaranteed on the Ile-de-Ré! 3 separate wash-blocks with showers, toilets, washing up areas and family and disabled-access bathrooms. A central lodge with free Wi-Fi, a TV room, a library and board games; a playground, boules pitch, table tennis and table football tables. Motorhome service point. Bikes available for hire. Fridges and BBQs for hire. Coin-operated laundry area with washing machine and dryer. 'Camper's corner' shop for any essentials you've forgotten and tourist information in reception. Activities for children throughout school holidays. Most campers don't get much further than the beach. It's only 20m to Basse Benaie beach which ultimately merges into the eastern edge of better known Montamer beach. Both will quickly soak up all of your time, whether it's sunning yourself, swimming or taking to the water in a boat. Elsewhere, La Salee is another excellent beach for swimming, while Grenettes is the most popular for surfers (you can hire boards right by the waterfront). The island has over 100km of cycle trails and bikes are available to hire from the campsite. Pedal across the island to see the impressive ramparts of Saint-Martin-de-Ré – the Vauban fortifications are now a recognised UNESCO world heritage site and were designed not only to accommodate the entire island population but also their cattle. An on-site restaurant serves homemade pizzas and hot snacks (open in summer and public holidays only). There's also fresh bread delivery each morning (make sure you order the evening before). For the best food, though, visit the island’s market stalls, with markets held every morning at la Flotte, Rivedoux and Sainte-Marie throughout the year. From La Rochelle, follow signs for Ile de Ré. When you reach the island, take the South road (Sud) signposted at the roundabout just outside Rivedoux, then when you reach Sainte-Marie, at the 2nd roundabout, follow signs for 'Sainte-Marie-Centre' and then the very clear signs for 'camping' until you reach the campsite. The nearest train station is La Rochelle SNCF station 20km away. La Rochelle also has an international airport. 150 pitches across 5½ acres (some occupied by pre-pitched safari tents) some with sea views.